This bread is brilliant because it looks so fancy, but it's so simple. All it takes is time and a little patience. If you've never made yeast bread before, this is a wonderful recipe to start with. I don't need to tell you how delicious it was, its beauty and flavor speaks for itself. I used leftover potato guts, but there are directions in the recipe for starting with an uncooked potato. One helpful hint: use an instant-read thermometer if you have one to make sure your warm water is the right temperature before you pour it over the yeast. If it's too hot or too cold, the yeast won't do its thing. The warm water should be between 110-115 degrees F.
1. Wash the potato and place in a small saucepan along with enough water to cover the potato by an inch. Place the pot over high heat, covered, and bring to a boil. Add a handful of kosher salt to the water. Simmer until the potato is tender when pierced with a knife, around 20 minutes. Drain the potato and let it cool. Peel the potato and mash finely with a fork. Set aside. 2. Put the yeast in a large mixing bowl along with a pinch of sugar. Add the warm water in a thin stream over the yeast, using a fork to help dissolve the yeast entirely. Let the mixture stand for a few minutes. 3. Pour the flour into the yeast water and stir with a fork, then add the mashed potato and the salt. The dough will be relatively thick and shaggy. Use the fork to incorporate the potato into the flour. Add 2 tablespoons of olive oil and begin to knead the dough by hand. It will come together quite quickly. Knead against the bowl for a minute or so, until it is relatively smooth. Add more flour if the dough is too sticky to handle. Form the dough into a ball and let it rest, covered with a kitchen towel, in the bowl for an hour. 4. Cut a piece of parchment paper to fit the bottom of an 8-inch cake pan. Using your fingertips, gently release the puffy and risen dough from the bowl and place it in the cake pan. Gently tug and pat it out so that it fits the pan. Cover the top of the focaccia with the tomato halves, distributing them evenly. Sprinkle the oregano and a large pinch of coarse salt over the tomatoes, drizzle with the remaining tablespoon of olive oil, and let it rest for another hour. 5. 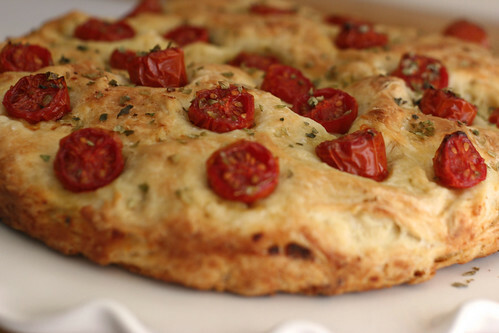 While the focaccia is resting, preheat the oven to 425 degrees F. Bake for 40 minutes, rotating halfway through. Cool on a rack for 20 minutes before removing the focaccia from the pan. Oh yeah, that looks amazing. I love the looks of that bread Amy!